We cruised The Strip in my friend Brian's Pontiac G8. We wanted to get a cool shot of him roasting the rear tires on Las Vegas Boulevard, but the police van (in the background) denied that sort of hoonage. On any given day or night the strip is filled with different automobiles you don't see everyday like this dually limo. Automobiles are a big part of Vegas, even some of the black jack tables are adorned with car culture. Las Vegas is filled with dealerships and showrooms for high-end cars. These businesses are hoping that someone pulls on that magic slot machine, wins big and heads right down to the Lambo dealership. The hotel parking lots were filled with some nice rides. We found this clean Camaro at the Flamingo. The first night we hit Diablo's restaurant in front of the Monte Carlo casino pretty hard. We had many cervesas and met lots of drunk girls who liked to have their picture taken. I love Vegas! 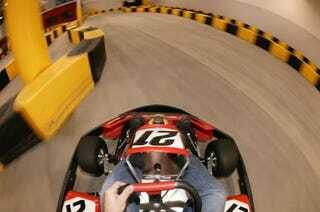 The next morning, heavily hung over, we dragged ourselves to Pole Position Raceway for some track time. Pole Position hooked us up with some laps on their indoor track. The Karts were electric and got around pretty good for the tight course. The racing was great, head to head style, with good bumping and passing. My vision was still blurry and my stomach a bit queasy from the night before. After a couple of laps we got the flow of the unfamiliar track and laid down some times we weren't totally ashamed of. At the end of our session Pole Position gave us a print out of our lap times which included our finishing position and overall ranking for the week. Instead of heading to the hotel room for some much needed rest and hydration, we decided to run some more laps. We can always sleep after our trip to Vegas.